Why wasting MILK on religious statues / stones… A Myth. 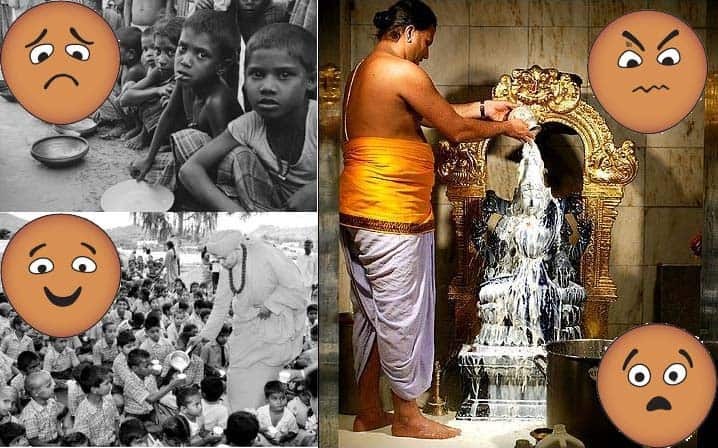 Home » Blog » Internet » Facts » Why wasting MILK on religious statues / stones… A Myth. Before writing something about this controversial topic (Wasting milk on religious statues), I want to make it clear that I don’t want to hurt anybody’s feeling about their religion. I am a Hindu myself and proud of being 1. Just seen a facebook post which is requesting everybody to offer just a tablespoon of milk on the Shiv-Ling or to any religious statue / stone. To tell you the truth, this only has inspired me to write these tough lines to support the cause. Its very hard to believe that in INDIA thousands of children are dying due to malnutrition, still many of us are offering MILK to the statues DAILY. Is this a MYTH or SUPERSTITION ???. Many efforts have been made to influence the peoples having these type of thoughts. Lots of movies have been released, dramas have been performed and books have been published to change the fixed minds. But none of them so far have been able to leave behind a significant hole. People still do what should not to be done in the name of “The lord” and religious beliefs. Honestly the ritual of pouring milk over statue / stone especially in a land where countless go to sleep without any meal every night is not acceptable at any cost, atleast I can dislike this openly. To refresh your memories, On 21 September 1995 at a temple in India’s Capital (New Delhi) it has been declared that the statue of lord GANESHA is accepting milk offerings :-). Within no time the news had spread beyond India, thanks to our active, TRP savvy media. They are intelligent people, don’t they have any responsibility to investigate before spreading this out ?. The biggest JOKE happens when one of the most reputed Indian Hindu organisation (Vishva Hindu Parishad) had announced this as a MIRACLE :-). Due to this, the whole phenomenon has been successfully replicated to the hindu temples among other big or small countries worldwide. Finally scientists visited the temple to investigate the phenomena and labelled this process as “Capillary Action“. This MIRACLE happened again in almost the same fashion on 20 and 21 August 2006 in the city of Bareilly (Uttar Pradesh, India). This time the rumors spread that the statues of Ganesha, Durga and Shiva are accepting the milk offerings. Scientists visited the temple and labelled this phenomena again as “Capillary Action“. Latest MIRACLE of this type happened in Trinidad on 21 September, 2010. Statues of lord GANESHA again reported accepted milk offerings there. As this is a religious issue, I don’t want to give any final verdict on this. I’m not against the belief of existence of the God but I maintain a good distance from the so called religious rituals. Donate the milk you people are pouring on statues / stones to these needful children s and earn true blessing from their families. I am certain that in return GOD will approve and deliver the desired blessing to you. Belief in the lord is “All Right” but not to the stage that fades all our senses. I repeat, Please STOP wasting precious MILK on these religous statues / stones. Feel free to share this among all your social networks OR you can add your honest opinion in the comments section below. At last, very very thanks for visiting. Keep visiting www.a2zinfomatics.com, We are always here to provide best information that MATTERS. Hey! I understand this is sort of off-topic however I needed to ask. Does operating a well-established website like yours take a lot of work? I am brand new to operating a blog however I do write in my journal every day. I’d like to start a blog so I can easily share my own experience and thoughts online.Please let me know if you have any ideas or tips for brand new aspiring blog owners. Appreciate it! Ahaa, its nice dialogue about this piece of writing at this place at this web site, I have read all that, so now me also commenting at this place. Great publish, very informative. I’m wondering why the other experts of this sector don’t understand this. You should proceed your writing. I’m sure, you’ve a huge readers’ base already!